Get started with sending eReferrals through Ocean by reading through this handy getting started guide. Each person who will be sending Ocean eReferrals will need to link their EMR and Ocean user accounts. This is especially important for auditing and tracking purposes. Each Ocean eReferral sender must link their EMR user account to their Ocean user account by following the steps below. This will allow individual users to send eReferrals to enable alerts and track activity. Select "Find Health Service" on the Ocean custom form or "Refer" on the Ocean toolbar. Select the CDS link to the Ocean Portal or the direct "Refer/Find Health Service" CDS link. Select "Find Health Service" on the Ocean eForm or "Refer" on the Ocean toolbar. 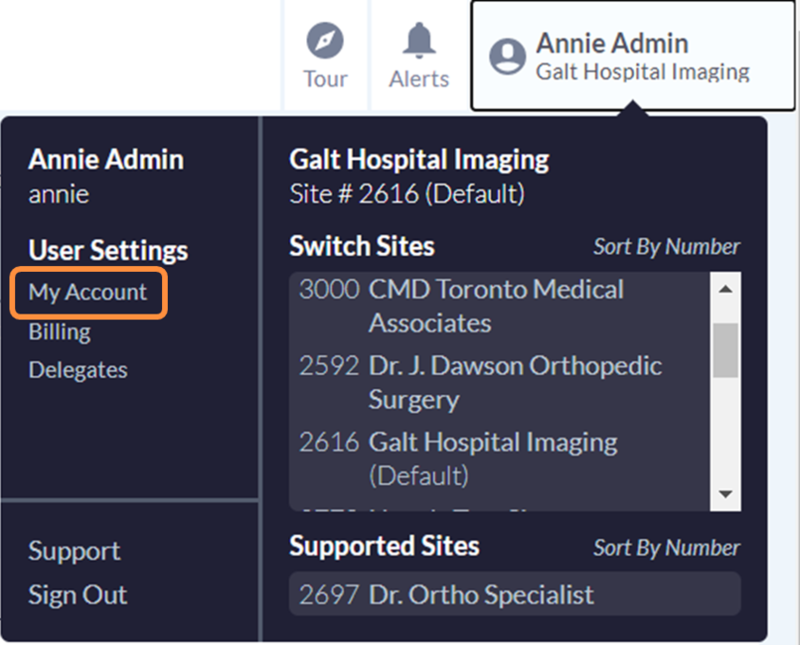 Log in to Ocean to link your EMR and Ocean accounts. Initiating a referral will open the Ocean Healthmap in an internet browser. Note: If your default internet browser is Internet Explorer, the Ocean Health Map requires at least Internet Explorer 11 to run properly. At the top of the Ocean health map, you will see a banner that says: "Hello [your EMR username]. Click here to link to your Ocean account.". Click this banner (or the "Sign In" button" above it) to sign in to Ocean with your Ocean username and password. Your EMR username will now be linked to your Ocean user account (an accompanying unlimited Ocean online user license, if applicable). Confirm that your EMR and Ocean accounts have been successfully linked. Log in to the Ocean Portal and navigate to the View My Account page. Verify that your the "EMR Username" field is populated with the exact same name as your EMR username. Configure which email addresses receive email notifications when eReferrals that you've sent are changed or updated. This article describes locations where you can configure your email addresses for eReferral notifications when sending eReferrals. To learn more about the rules/logic that Ocean uses to determine which email address to send the eReferral notifications to, please refer to "Where do eReferral notification emails get sent to?". Several email address can be configured in the "View My Account" section of the Ocean Portal. These will be the email addresses of eReferral senders that get notified about changes in specific referrals that they have sent (e.g. booking updates). You can access this section by signing in to the Ocean Portal, clicking on your name at the top right-hand corner of the screen and selecting "View My Account" from the dropdown menu that appears. From there, you can set which email address receives specific Ocean notifications. This is the personal email address associated with each user with an Ocean account. This is the email address that generally receives clinical notifications, such secure message notifications (patient responses, eForm completions, etc.). This is the email address of the referrer that will be sent referral notifications, such as eReferral booking updates. If you make any changes, ensure that you save your changes before leaving this page. If you work with an MOA, receptionist, nurse, resident or student who will be sending eReferrals on your behalf, you will want to invite them to create an Ocean user account and set them as your clinical delegate. This step is an optional part of setting up an Ocean eReferral sender who will be sending online messages or eReferrals on your behalf. Email notifications for eReferrals sent out by a delegate user will be sent to the "Referral Notification Email" or "Clinical Delegate Email" of the user they are set as a delegate under (this is defined in the main referring provider's View My Account page). Invite your delegate(s) to create an account on your Ocean site. Enter the Users section (selected from the menu along the left). Scroll to the bottom of the page and click the "Invite Colleague..." button (on the right hand side of the page). Enter your colleague's email address and select "OK". Your colleague will receive an email prompting them to create an Ocean user account. Once your colleague has created an Ocean account, they will be automatically added to your site. Add your delegate(s) as a delegate user on your account. Log into the Ocean Portal. Click your name in the top right hand corner and select "View My Account" from the menu of dropdown options. Navigate to the Delegates tab. Select "Add Delegate" and select the username(s) of the user that you want to add as your clinical delegate(s). You can add any number of delegates to be associated with your Ocean user account. You can select one of your delegates to be your primary delegate. Only this primary delegate will be covered under your own Ocean Online subscription (if applicable). Note: The primary delegate MUST be either an MOA, receptionist, nurse, resident or student. If your clinic most often sends eReferrals to a specific destination clinic or group of clinics, you may want to save these sites as Favourites. This will allow for easy and efficient sending of Ocean eReferrals to your preferred clinics. This step is an optional part of setting your site up to easily and efficiently send Ocean eReferrals to preferred destination clinics. To begin, navigate to the Ocean Healthmap. If you aren’t already signed into your Ocean account, do so using the blue “Sign In” button located at the top right corner of the screen or by clicking the “Sign In to view your favourites” link located in the left-hand column of the screen. Note: You will not be able to add or manage favourite listings if you are not logged into your Ocean account. Search for and select the listing in the Ocean Health Directory that you want to add as a favourite. You’ll then be presented with an overview screen displaying such details as the listing’s contact information, distance, and services offered. Note the light blue “Add to Favourites” button. Clicking this button will open a dialogue window that will ask you where you would like to save the selected listing. Choosing “My Personal Favourites” will save the listing to your individual Ocean account’s Favourites. Other users belonging to your Ocean Site will not be able to view any of these Favourites. Choosing “My Site’s List of Favourites” will make the selection available to all the other users attached to your Ocean Site. At any time, you can view all the listings you or your team have favourited by clicking the heart icon (♥) on the sidebar along the left. This will open the Favourites panel for you to review. Any listings you have favourited when selecting “My Personal Favourites” from a listing’s summary page. These are only viewable by you and you alone. Any listing favourited by yourself or other users on your site when selecting “My Site’s List of Favourites” from a listing’s summary page. If other Ocean Site members have favourited any listings, they will be visible to you in this area. A suggested set of popular listings based upon your location. Favourites in any category (“Your Favourites” or “Your Site’s Favourites”) can be reordered, grouped, or deleted by selecting the “Edit” (pencil and paper) icon located in the top right corner of the Favourites panel. Clicking this “Edit” button will change the panel state into edit mode, allowing you to manage both your personal and site-wide Favourites. Click the circular red “Remove Favourite” icon to the right of any Favourite entry to remove it from your list. Note: Favourites will be removed immediately with no prompt to confirm. If you remove a favourite by mistake, you will need for search for it again in the directory and re-add it to your Favourites. To change the listed order of Favourites, click and hold the grey up-and-down arrow icon located on the left of each Favourite. While continuing to hold the mouse button, drag the favourite to the desired position in the list then let go. By default, Favourites will be grouped under an “Uncategorized” heading. Click the “+ Add a group” link under either “Your Favourites” or “Your Site’s Favourites” section to begin setup of a new Favourites category. A popup dialogue will appear asking you to name your group. Type in a name for your new category and then click the “+ Add Group” button to save your changes. Using the “Managing Favourites” instructions for changing the order of your Favourites, you can now drag Favourites under your newly-created Favourites category. Categories or groups are helpful for organizing favourites by location or health services provided, but you are free to make any groupings that make sense for your organizational needs. Just like individual Favourites, groups can be deleted and moved around, as you see fit. Note: you cannot delete a group if there are any favourites nested within it. Drag your Favourites to another group before attempting to delete a grouping. If you wish to rename a group heading, simply click the “Rename group” (pencil) icon located to the right of the group title. When you are finished making changes to your Favourites, click the “Finish editing” checkmark icon located in the top right of the "Editing Your Favourites" panel. You will then return to the default view state of the Favourites panel.